The U.S. Equestrian Federation announced in a press release that the suspensions leveled against hunter trainers Larry Glefke and Kelley Farmer have been temporarily lifted pending further arbitration. Glefke was suspended for two years and fined $24,000 and Farmer was suspended for 18 months and fined $18,000 following a positive test for GABA on a horse in their care. 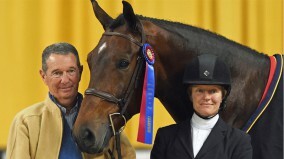 The initial suspensions and fines were handed down in January of 2017 and have been wrapped up in legal disputes between Glefke and Farmer and the USEF ever since. With the suspensions lifted, Glefke and Farmer are reinstated as members in good standing with USEF and plan on immediately getting back in the show ring on Jan. 5 in Wellington, Florida. “Obviously Kelley and I both feel very vindicated, but for anything else you have to talk to our lawyers,” Glefke said when reached for comment. The USEF also noted in its statement that any money won by Glefke and Farmer during this temporary lift of the suspension will be held in an escrow account pending the final outcome of the arbitration, now scheduled for February. The last news of the legal battle came in August of 2017 when the U.S. Olympic Committee ruled in favor of U.S. Equestrian on a motion to dismiss Glefke and Farmer’s complaint to the governing body. The next step for Romm and Glefke and Farmer’s legal team was arbitration. USEF Bylaw 705, in accordance with the Ted Stevens Act, guarantees that the USEF will submit to arbitration in the case of a controversy over a member’s opportunity to participate in athletic competition. Bonnie Navin, another lawyer for Glefke and Farmer, said arbitration between her clients and the USEF began shortly after the USOC ruling in August and has continued for the past six months in Miami. Glefke and Farmer’s lawyer Bonnie Navin said arbitration between her clients and the USEF began shortly after that ruling in August and has continued for the past six months in Miami. *This article was updated to include information about the USEF bylaws and the organization’s agreement under the Ted Stevens Act to submit to arbitration in the case of a controversy over a member’s opportunity to participate in athletic competition.